Firefly were approached by Newington College to create an online system to manage and deliver their three fortnightly newsletters to the school community. From the outset it was clear that the majority of parents, students and teachers were tech-savvy and time-poor, but keen to be informed with up-to-date news. We created layouts for the online newsletter which adapt to display on the viewer’s device. This allowed for users to access the newsletter from desktops, laptops, iPads and smart phones with the content displayed optimally and consistently across devices. Much more than an email. The online newsletter was an ideal solution for parents on the go, who often checked the newsletter on their phones while commuting or waiting for their kids at pick up. 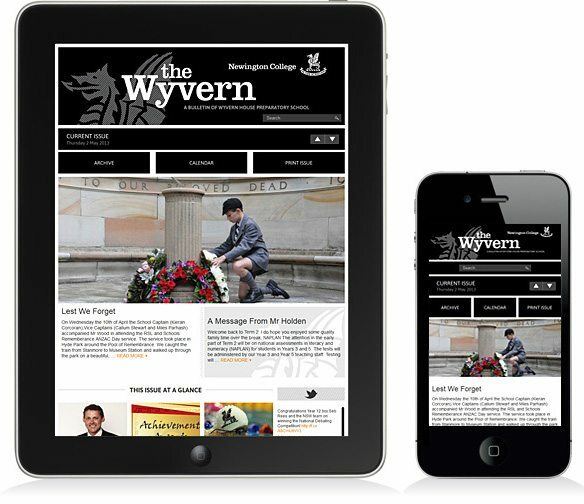 The email and newsletter designs incorporated bold, graphic branding elements for each of their campus newsletters: Black and White, Prep Talk and The Wyvern. ‘Smart’ templates allow for flexible content layouts and generate EDM (email newsletter) and printable versions automatically when the newsletter is published. Articles are created easily and simply; add your text, any images and assign to a newsletter issue. The publishing system takes care of generating the list of Articles, an optimised email view, a printable layout etc. This helps to streamline the publishing flow so that there’s no double-handling of content. From within the CMS console the generated EDM can be emailed to the subscriber base via direct integration with Campaign Monitor’s bulk email service. Online Newsletters have also subsequently been implemented for other initiatives, such as Alumni using The Buzz publishing platform. Visit The Buzz for further information on online newsletter publishing.